If you go to a place with an English menu in Europe, your receipt will almost certainly say “Tip is not included.” Oh, those smug Europeans. If you are as interested in the development of this social norm as I am, read on. If you’re game for European-specific advice, skip to the next section. Or get a much briefer run down right here. Later that century, affluent Americans who traveled abroad took to tipping waiters and other people in the servant class. It was a clear way to show they knew of European culture. As U.S. tipping customs took hold, some wild stories came out, according to Azar (PDF - page 14). “Under these conditions, one might expect that the tip takers would try to increase tipping by different means. Often, these means included hurting non-tippers in various ways. Servants in hotels sometimes made small chalk marks or other small signs on a non-tipper’s suitcases, warning servants in other hotels not to assist that man, or to drop his luggage “by mistake.” In restaurants, the revenge on non-tippers or poor tippers was by insulting them or by giving them slow service in their next visit. Maybe the most extreme form of revenge took place in Chicago in 1918, when a hundred waiters were arrested because they used certain powder in the dishes of known opponents to the tipping system. In many establishments, however, good service was always required from the employees, and giving poor service to a non-tipper could result in the dismissal of the employee. Indeed, some expensive restaurants in the United States, Aza wrote, tried charging waiters for the chance to serve, which also happened in some French restaurants. Contrary to today’s conception that tipping is a result of the free market, “Gunton’s Magazine (1896, p. 16-17) called tipping offensively un-American, because it was contrary to the spirit of American life of working for wages rather than fawning for favors (Azar 19 PDF). Meanwhile, during the 20th century, Western European countries took on heavily socialized senses of government welfare. Living wages gave way for less a need to tip. Still, the habit lingers from the past and only blossomed as traveling Americans regularly over-tipped. In the United States could never leave a restaurant without tipping. …I couldn’t - I’ve had too many tip-based jobs. For terrible service, I’d leave 5 percent, something I’ve only done once in my life. I’ve only left 10 percent in a U.S. restaurant twice, that I can think of, but more normally give a 15 percent minimum on basic service. Better than that, I leave upwards of 20 percent and have done better still for smaller bills, at places I return to - and when I am feeling well-funded. In Canada and Australia - other countries with U.K. roots - 10 percent is a somewhat stringent basic, like the American 15 percent, but no country, of which I know, comes near to the American necessity of tipping. So what about in Europe today? Sean and I couchsurfed in Switzerland with Dule, a Serbian academic working in Zurich. He lived in the largest Swiss city for more than two years. When we asked him when to tip, he looked at both of us, sat back, lifted his head and laughed. “I have no idea,” he said. In Serbia, he told us there was never a concentration on tipping - though he left his native country when he was still a teenager. Indeed, the very obsession with tipping seems an American one. Assuming you’re obsessed too, I collected the best knowledge I could for all the places we visited and some more. London: Check your receipt. I went at least one place where tip was included. Otherwise round up to the nearest pound, and don’t give more than a pound or two at a restaurant. At a bar, just leave leftover pence for your first drink. France, Germany, Spain, Netherlands, Belgium: Never more than one or two euro. More usually, just leftover change. I was hounded by Sean’s brother to leave 10 percent of the small bill at a Parisian cafe. The waiter told me twice in French, “C’est trop” - it’s too much. Still, at a full-out restaurant, if you’re feeling like a big spending, you might go to 10 percent. But, again, this is an American influence and fairly large. If you’re using a credit card, try to leave the tip in cash because I was told by more than one party that credited tips often don’t make it to the server. Italy: I am told this also goes for Finland, a 12.5 percent “service charge” is very often added to your bill. Make sure of it. In Italian, that might look something like “spesa per i servizi,” but it’s often in English. It’s also my experience that in Venice particularly, some restaurants will charge a fee to sit down. This covers the tip, at least in my mind. Switzerland: Look, everyone is wealthy here. Alright, that might be unfair, but it seems Dule’s confusion was so real because you really don’t necessarily have to tip in Switzerland. If you do, just round up to the nearest Swiss franc, give a warm smile and call it a day. Hungary: Peep this, because Sean’s youngest brother didn’t clue me in: “In countries like Hungary and Egypt it is normal to tip almost anyone and everyone who provides service for you (even including professional jobs like doctors). It’s still though fine to round up, without percentages and such. Czech Republic: It isn’t so strict - my friend Richard, a native whom I asked, seemed confused by my worry about it - but in Prague particularly, he said, roughly 10 percent is a good guide. When I tried to give the tip to the young woman who served me, she thought I wanted change. Tip is not something that socially compulsory. Denmark: No tipping. Seriously. I can verify the same for Japan. Sweden: Five to 10 percent, but this is usually done, like other Euro countries, by rounding the bill. Taxis: “Round up the fare, letting the driver keep the change or 2-5€ for longer journeys is sufficient,” according to Contiki. But more important, be super careful about cabs abroad. In many countries, you negotiate, so if you don’t settle up before you get inside you can get yourself in trouble. I saw this played out for another American in a hostel we visisted in Prague. Find out before you go. Restrooms: Oh good God. In almost all of Europe there is a set charge, and Sean and I hate it. So pay that. If there’s a tip tray, instead, never give more than small change. OK, so the rule, as they say, is there is no rule. But, if you are doing a bit of jetsetting and get caught somewhere without knowing, then the rule is to round up. Give an even amount no more than a few bucks over the bill. If you’re going somewhere fancy, oh, well, that’s somewhere I can’t help. Yes, and seriously, you can tip me for this post via my paypal account. 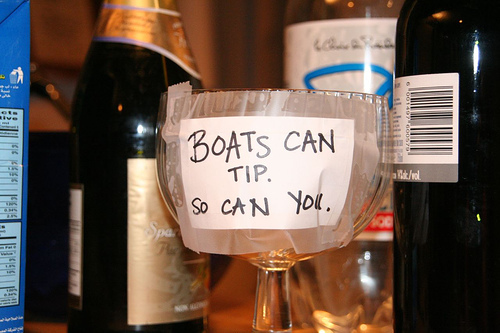 Tipping is quite complicated, especially with different countries and customs. Personally I think it shall be a volunteer giving, rather than everyone-do-so or required. As to the tour guides, if they really did a great job, I would be more than happy to thank them for their accompany. But if poorly guiding, there’s no point to offer tips.